Arsenal got dumped out of Europe in the Round of 16 yet again as Barcelona romped to a comfortable 5-1 aggregate win. The defending champions made light work of the English side, with each of Messi, Suarez and Neymar scoring but the Gunners only had themselves to blame for being scattergun. Arsene Wenger started with Alexis Sanchez on the right giving young Nigerian Alex Iwobi an opportunity to start on his favoured left hand side. Ozil and Welbeck started in central roles with Ozil playing off the Englishman, and the advanced role of the German meant Arsenal were basically playing with 4 in attack. Whether Arsene Wenger intended for the Gunners to play that way can not be said for sure but that did augur well whenever his side attacked, but the moment they lost the ball, Barcelona would roar past the Arsenal midfield at will. Luis Enrique stuck with the template 4-3-3 for the European champions that has brought them many a trophy in the past 18 months. And the players showed good positional discipline with the 3-man midfield pouncing on every dispossession and feeding the front line. This is where Andres Iniesta took the game by the scruff of its neck, intercepting and making smart passes to keep the game ticking ensuring the transition from defence to attack took no longer than the blink of an eye. While not many gave Arsenal a chance on the night, the visitors created a bucket load of chances at the Camp Nou. If not for the poor finishing by the away side, they might even have led the Spanish champions by a couple of goals before Suarez scored to put the tie to bed. This is what happened between minutes 37 and 41- Ozil tees up a cross, Alexis lays the ball to Elneny. Shot blocked. Bellerin drops a gorgeous cross on Alexis’ head. Wide. Welbeck put through on goal by Iwobi. Blocked. This is just a 3-4 minute spell, Arsenal had more chances, but their nerves in the box only added to what pundits and fans had always feared- the lack of a quality striker to ultimately blow up Arsenal’s season in smoke. Hector Bellerin finally started a game at the Nou Camp, but the Barcelona youth product looked a little dazed by the occasion. As always the Spaniard was brilliant in attack, combining well with Alexis Sanchez on the right and even dribbling past Rakitic and Alba on a couple of occasions. But as a defender, Bellerin was found wanting here yet again, unable to contain the romping Alba and Neymar, often getting sucked way too high up the pitch. The balance isn’t yet there in the youngster’s game, and if he is to replace Dani Alves, as has long been speculated, there need to be improvements. Unlike his Spanish teammate, Koscielny is no youngster and has been around long enough to be counted as one of the best defenders across Europe for some time now. But on this occasion the shortcomings of his frontfoot defending were on exhibition. First Neymar found Messi with a dink from the midfield, and despite the Argentine having no head start over Koscielny, he found himself past the Arsenal defender in no time with the latter still looking to find his feet. Then again for the first Barcelona goal, Koscielny refused to clear the ball playing it out from the back. Barcelona hunted in packs, pressing from the front as Suarez dispossessed Koscielny, later feeding Neymar in the same play leading to the goal. Koscielny couldn’t even make it to the 18-yard box when Neymar wheeled away in celebration. The difference in the quality of the frontlines doesn’t even dignify a discussion, and that is the difference that showed on the scoreboard after the final whistle. 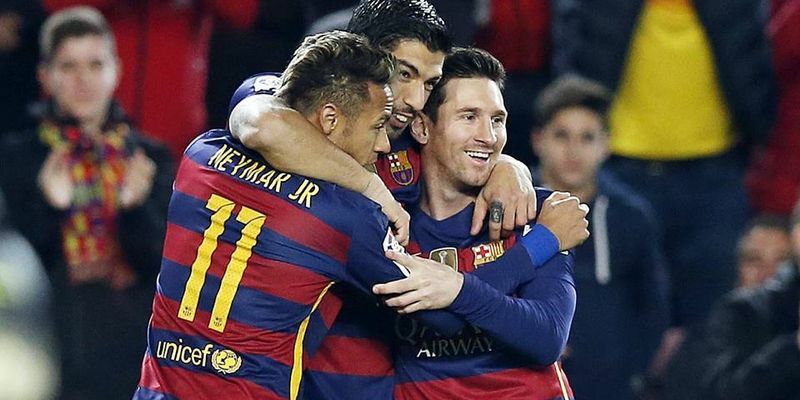 Messi, Suarez and Neymar scored with 3 shots on target each, the same number the entire Arsenal team managed. Welbeck had 5 shots in the game, none on target. Arsenal had a conversion rate of 5% compared to Barcelona’s 17%. If the numbers haven’t spoken loud enough, Barcelona took their chances and knew where the goal was. Arsenal didn’t. One can only wonder what could have been, if Arsenal had one of MSN at the end of the numerous chances they had on the night. In short, Arsenal have nobody but themselves to blame for their exit. Despite starting this game 2-0 down in the tie, they did enough on the night to qualify, let alone go home with a win. The lack of a finisher has derailed their season in the past month and much like the first leg they were very much in the game here too, but the uncertainty of the attackers in the box cost the Gunners the game, and it was no surprise that the only goal they scored was from outside the box. Barcelona on their part, were well, Barcelona. Wenger later said Messi, Suarez and Neymar make football look like art. But is magic an art?